for the destination I chose "SQL server native client 10". then I selected copy data from one or more tables or view. It seems that I can not import identity columns and timestamps columns, so how I can force these values to be imported? With all due respect to Kishore's answer, that approach is valid if you're modifying the packages. 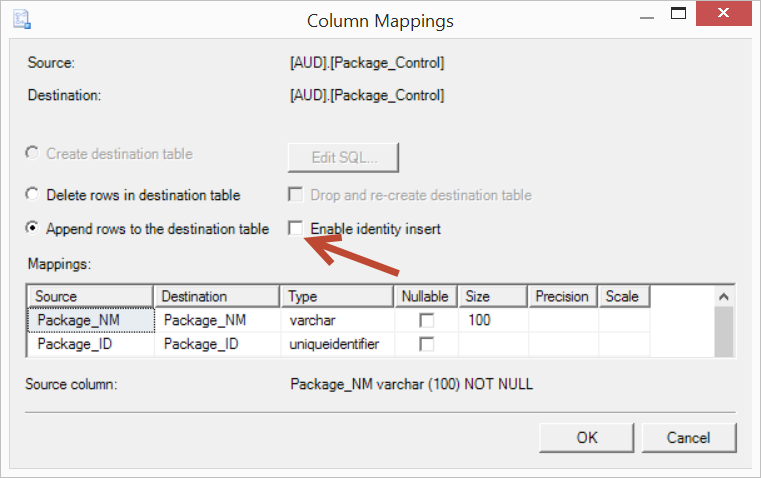 Since you're using the import/export wizard, the more straight forward approach would be to check the Enable Identity Insert box on the Column Mappings tab. In the resulting screen, click the Enable identity insert property and your identities will be replicated over. Same net result as issuing SET IDENTITY_INSERT TableName ON & OFF but this is done automagically at build time. Not the answer you're looking for? Browse other questions tagged sql-server sql-server-2008 ssis or ask your own question.